Size: 360x490 mm, wide margins. Antwerp, 1579. From the Ortelius Theatrum Orbis Terrarum. 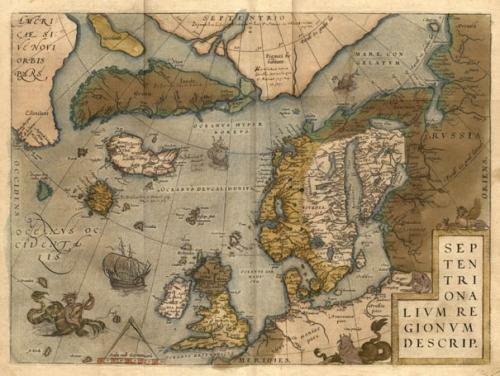 A double-page engraved map with Latin text on verso showing Northern Europe. Of particular interest are the mythical islands of Brasil, Frisland and St Brendan. Also the imaginary Polar continent is depicted with a note that tells us that pygmeys live there. A portion of North America appears in the upper left corner. The map has some scattered soiling and a short early owner's manuscript note near the top of the image. Generally the map is in good antiquarian condition. This is the first state of the map. Burden 40. Van den Broecke # 160.